Honey bees are known for several striking social behaviors, including a complex pattern of behavioral maturation that gives rise to an age-related colony division of labor and a symbolic dance language, by which successful foragers communicate the location of attractive food sources to their nestmates. Our understanding of honey bees is mostly based on studies of the Western honey bee, Apis mellifera, even though there are 9–10 other members of genus Apis, showing interesting variations in social behavior relative to A. mellifera. To facilitate future in-depth genomic and molecular level comparisons of behavior across the genus, we performed a microarray analysis of brain gene expression for A. mellifera and three key species found in Asia, A. cerana, A. florea and A. dorsata. For each species we compared brain gene expression patterns between foragers and adult one-day-old bees on an A. mellifera cDNA microarray and calculated within-species gene expression ratios to facilitate cross-species analysis. The number of cDNA spots showing hybridization fluorescence intensities above the experimental threshold was reduced by an average of 16% in the Asian species compared to A. mellifera, but an average of 71% of genes on the microarray were available for analysis. Brain gene expression profiles between foragers and one-day-olds showed differences that are consistent with a previous study on A. mellifera and were comparable across species. Although 1772 genes showed significant differences in expression between foragers and one-day-olds, only 218 genes showed differences in forager/one-day-old expression between species (p < 0.001). Principal Components Analysis revealed dominant patterns of expression that clearly distinguished between the four species but did not reflect known differences in behavior and ecology. There were species differences in brain expression profiles for functionally related groups of genes. We conclude that the A. mellifera cDNA microarray can be used effectively for cross-species comparisons within the genus. Our results indicate that there is a widespread conservation of the molecular processes in the honey bee brain underlying behavioral maturation. Species differences in brain expression profiles for functionally related groups of genes provide possible clues to the basis of behavioral variation in the genus. The western honey bee, Apis mellifera, is a highly social insect that has emerged as one of the model organisms for using genomics to study the mechanisms and evolution of social behavior . Honey bees are known for several striking social behaviors [2, 3]. For example, adult worker honey bees display a complex pattern of behavioral maturation that involves working in the hive when young and foraging when older; this gives rise to an age-related division of labor in honey bee colonies that is thought to be one of the factors contributing to the spectacular ecological success of social insects . Honey bees also are known for their symbolic dance language, by which successful foragers communicate the location of attractive food sources to their nestmates [3, 5]. Behavioral maturation in adult honey bees is associated with coordinated changes in expression of thousands of genes in the brain [6–8], and a few genes have been identified that have causal effects [9–11]. Molecular or neural components of honey bee dance language have not yet been identified. Our understanding of honey bees is mostly based on studies of A. mellifera, even though there are as many as 9–10 other members of genus Apis [12–14]. Apis is an ancient lineage of bees that evolved in tropical Eurasia ca. 8–11 million years ago  some migrated north and west, reaching Europe by the end of the Pleistocene epoch, 10,000 yr ago . Phylogenetic analyses partition the genus into three groups. The cavity nesters form a monophyletic group and consequently A. mellifera and A. cerana are more closely related to one another than to dorsata and florea [12–14]. A. dorsata and A. florea, two open-nesting species, are in separate lineages, with florea part of the most basal lineage in the genus . Other Apis species display a rich combination of similarities and differences in behavior and ecology relative to A. mellifera . Studies are limited, but there is some evidence that workers in other Apis species also show patterns of behavioral maturation similar to A. mellifera ; in all species studied, young workers perform nest work and older workers forage . 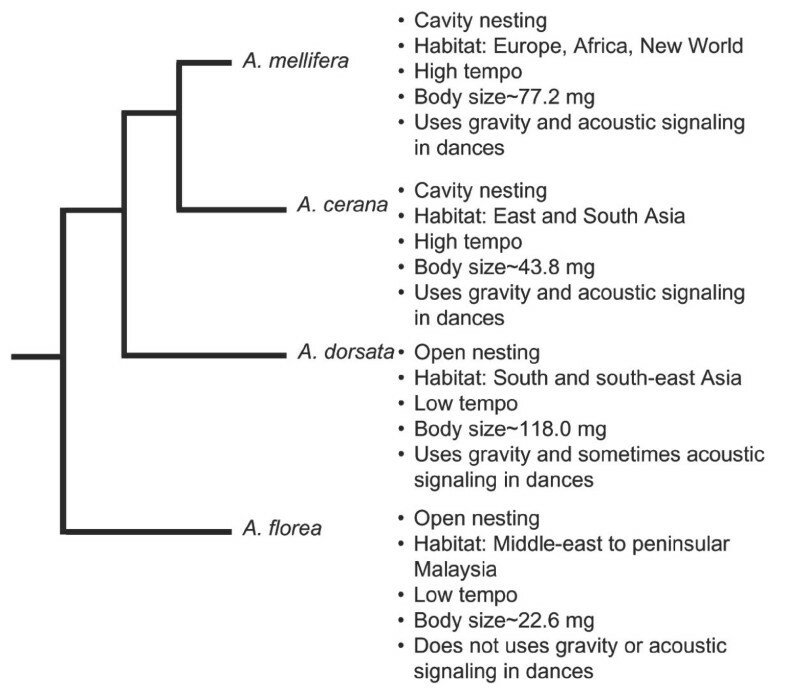 Conversely, comparative studies of key members of the genus, A. mellifera, A. cerana, A. florea and A. dorsata, have revealed marked differences in dance language, habitat, nesting habit, body size and worker "tempo" (Figure 1). Known differences in ecology, behavior and physiology among the four species of honey bees studied: A. mellifera, A. cerana, A. florea and A. dorsata. Worker "tempo" is measured in terms of colony biomass, daily energy consumption, metabolic rate in terms of mass loss of mass loss . Habitat and nesting data , body mass , dance language data [37–40]. To facilitate future comparative studies of honey bee behavior at the genomic and molecular level, we performed a microarray analysis comparing brain gene expression of foragers with that of newly eclosed one-day-old adult bees ("one-day-olds") for A. mellifera, A. cerana, A. florea and A. dorsata. A previous study demonstrates that of the different age groups studied for A. mellifera, one-day-olds form perhaps the most discrete and cohesive group in terms of brain gene expression profiles . In addition, a significant amount of brain maturation occurs between pupation and 4 weeks (foraging age) as evidenced by neuropil expansion and lengthening and branching of dendrites of Kenyon cells of mushroom bodies . Also among adult groups compared, the most consistent differences in all parameters of brain maturation were seen between one-day-olds and foragers. Genomic resources are currently very limited to a tiny fraction of the animal species available for study. Only one species of honey bee, A. mellifera, has a custom-designed microarray, made from an A. mellifera brain EST library  and representing ~ 5500 genes or ~ 50% of the currently annotated genes in the A. mellifera genome . We show that this A. mellifera cDNA microarray can be used effectively for cross-species comparison of behavioral maturation within the genus. Brain gene expression profiles between foragers and one-day-olds showed differences that are consistent with a previous study on A. mellifera  and were comparable across species. Species differences in brain expression profiles for functionally related groups of genes provide clues to the basis of behavioral variation in the genus. A total of 4432 genes that represented 63% of the genes present in the array passed through our stringent analysis filters. This suggested the suitability of the array for interspecies comparisons. Only those spots which hybridized above the mean threshold intensity for all species were used (see Methods). The number of cDNA spots (genes) hybridizing above threshold fluorescence intensity was less for the three Asian species compared to A. mellifera (A. mellifera 5595, A. cerana 5202, A. florea 4556, A. dorsata 4535). Performances of the four species on the microarrays were comparable and in keeping with known differences and estimated approximate evolutionary distance. Thus A. cerana, sharing a monophyletic origin with A. mellifera [12–14], apparently displayed higher hybridization efficiency compared to the more distantly related A. florea and A. dorsata. We compared brain gene expression between foragers and one-day-olds of each colony, within each species. That is, the two samples hybridized on each array always belonged to the same species. This was done to avoid "false positives" that could arise due to interspecific differences in hybridization efficiency to the microarray [19, 20]. We calculated gene expression ratios of forager to one-day-old brain expression levels for every gene and each replicate pair of arrays (data not shown; mean ratios available in an online repository ). Any difference detected between species using this ratio cannot be attributed specifically to either foragers or one-day-olds. To measure replicability across experiments, we compared our data with a previous study . Of the genes found to be significantly regulated between foragers and one-day-olds in each of the species in the current study, 58 – 75% also had been found to be significantly regulated between foragers and one-day-olds in reference 8 (Table 1). The higher number of genes significantly regulated between foragers and one-day-olds in reference 8 compared to the current study probably reflects a higher statistical power due to increased replication in the former study . Nevertheless, all four species performed comparably on the A. mellifera cDNA microarrays and maintained consistent patterns of brain gene expression differences. This demonstrates the utility of the array for carrying out comparisons between Apis species. Data belonging to each species were analyzed separately to obtain genes significantly regulated between foragers and one-day-olds by an F test (p < 0.01), numbers in parentheses. The comparison set was obtained from Whitfield et al 2006  and consisted of genes significantly regulated between foragers and one-day-olds (p < 0.001). Only those genes that were present in the gene list of at least one species in the current study were included in the comparison set. Intersects of pair-wise comparisons between the two datasets are given along with results of Chi-square tests. 1772 genes showed significant differences in brain gene expression between foragers and one-day-olds (ANOVA, F-test, p < 0.001) in any species. However, only 218 genes showed significant difference in forager/one-day-old ratios of brain gene expression (F/DO) between at least 2 species (p < 0.001). At this P value level the number expected by chance alone would be 5. A pair-wise comparison between species showed that the comparison between A. florea and A. mellifera resulted in the greatest number of genes (114) showing F/DO differences between any pair of species (Table 2). This is perhaps a reflection of the fact that of the 4 species compared, A. florea and A. mellifera show the most extreme differences in behavior and ecology (Figure 1). A. florea and A. mellifera also are among the most distantly related pairs of species in Apis . However, the comparison between A. cerana and A. dorsata resulted in the fewest (18) number of genes showing F/DO differences between any pair of species (Table 2) and these two species also differ extensively in behavior and ecology. However, both cerana and dorsata are Asian species while mellifera is native to Africa and Europe . Rows above diagonal indicate number of genes with significantly different expression profiles (p < 0.001, F test). 218 genes showed significant differences in expression between at least two species. A Principal Component Analysis on the brain expression profiles of all 218 genes that showed species differences at p < 0.001 revealed that there were clear patterns of gene expression that differentiated the 4 species from each other (Figure 2). Principal Component 1 (PC1), which accounts for 57.7% of the variance, describes the predominant brain expression pattern as follows: genes that were upregulated or downregulated in forager brains compared to one-day-olds in one species were also likely to be upregulated or downregulated in forager brains compared to one-day-olds in other species (Figure 2a). The major inference that can be drawn from this result is that the molecular processes underlying the maturation of a one-day-old bee to a forager are largely conserved between species. This is consistent with observations suggesting that workers in other Apis species show the same basic pattern of behavioral maturation that A. mellifera does . 4(A to D): Results of a Principal Component Analysis of the 218 genes expressed significantly differently between at least two species (p < 0.001). Each bar represents a replicate F/DO ratio. Color key/abbreviation: Blue = Apis florea/AF, Green = A. cerana/AC, Yellow = A. mellifera/AM, Red = A. dorsata/AD. The order of species is the same in every graph. Different letters of the alphabet depict significantly different mean values according to a post-hoc Tukey's test on an ANOVA of the principal components. Gene loadings on principal components provided in Additional file 1. PCs 2 and 3, which together accounted for 26.8% of the variance, revealed species differences in brain gene expression that were strong enough to distinguish all the species (Figure 2b and 2c). However, these differences do not overlap with known ecological or physiological differences. For example, the differences do not reflect the fact that two of the species (florea and dorsata) are open nesting while the other two are cavity nesting; or that all four species differ in size with dorsata almost 2.5 fold larger than florea . PC 4 (Figure 2d) reflected a pattern in the data that indicates that a component of the variance in brain gene expression is attributable solely to differences between A. dorsata and the other species. There are indeed distinctive features of dorsata biology relative to the other three species, including migratory habits, defensive behavior, and its much larger size , but it is not known whether the differences we detected are related to these aspects. To derive inferences (albeit highly speculative) related to functional differences between the species that could guide future studies, we analyzed the 218 genes for overrepresentation in functional Gene Ontology  categories (GO, 588 Biological Process terms and 322 Molecular Function terms spanning all levels). Available Drosophila orthologs for 145 of the 218 genes were subjected to an enrichment analysis  (Table 3). The most significant enrichment among the categories tested was genes implicated in "response to biotic stimulus" and "defense response" (Table 3). This finding is intriguing because these categories encompass responses by a cell or an organism (in terms of movement, secretion, enzyme production, gene expression, etc.) as a result of a stimulus caused or produced by another living organism. Behavioral maturation from one-day-old to forager involves changes in endocrine activity, metabolism, circadian clock activity, brain chemistry and brain structure . In addition, honey bees are highly social organisms and thus highly responsive to their nestmates and conspecifics. One way that honey bees respond to changes in their colony condition is by altering their rate of behavioral maturation ; this has only been studied in A. mellifera. Apis species differ among many other things, including colony size, predator pressure, prevalence of brood diseases and reproductive colony fission . Therefore these groups of highly regulated genes might reflect differences in behavioral maturation processes brought about by differences in social cohesiveness and colony integration. 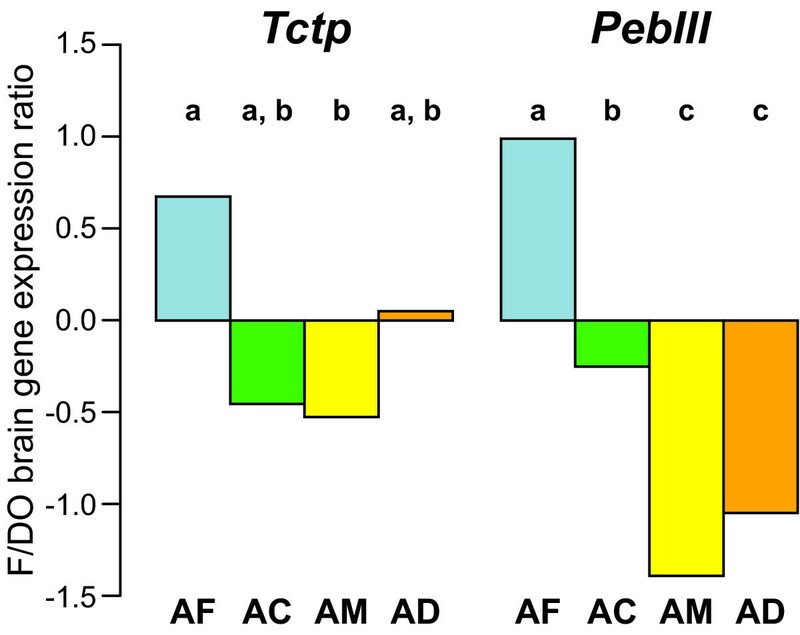 Along these lines, we note that two genes from these two categories, honey bee orthologs of Drosophila PebIII and Tctp, which have previously been shown to be lower in foragers compared to one-day-olds in A. mellifera,  showed a reversed and significantly higher F/DO expression ratio in A. florea (the open nesting, dwarf species living in small colonies) compared to the other three species (Figure 3). Mean forager by one-day-old brain gene expression ratio (F/DO) of two example fly ortholog genes that show interesting patterns of difference between especially A. florea and A. mellifera. Species key: AF = Apis florea, AC = A. cerana, AM = A. mellifera, AD = A. dorsata. Different letters of the alphabet depict significantly different mean values according to a post-hoc Tukey's test on an ANOVA of the F/DO ratios. A couple of other interesting groups of genes were those involved in metabolic processes, e.g., carbohydrate and amino acid metabolism. Similarly, most of the molecular functional categories that emerged as significantly enriched are also groups of genes that participate in metabolic processes, e.g., exo- and metallopeptidases, hydrolases, and genes coding for o-methyltransferases, and carrier proteins (Table 3). This is interesting because one of the most striking differences between the four species relates to differences in worker "tempo." Measurements of colony attributes led Dyer and Seeley  to conclude that open-nesting species (florea and dorsata) have a lower overall level of activity than do the cavity-nesting species (mellifera and cerana). It is reasonable to speculate that differences in colony activity levels are related to molecular processes associated with worker metabolism. Our results provide potential molecular correlates for these behavioral and ecological observations, and suggest that further analyses of genes in these categories would be particularly fruitful for understanding the ecology of genus Apis. Another category of genes were those implicated in circadian processes. Finding that genes related to circadian rhythms are overrepresented (albeit weakly) on the list of genes showing significant species differences in brain expression is notable from the perspective of honey bee dance language. Brockmann and Robinson  discussed possible functional connections between the circadian system and the sun-compass system that is used by honey bees to communicate directional information during dance. The possibility of species differences in these systems is suggested by the fact that A. mellifera, cerana and dorsata dance on vertical combs and transpose sun-compass based information to gravity-based information, whereas A. florea dances on horizontal comb and does not make this transposition. A more detailed view of the molecular machinery that might underlie species differences in Apis was obtained by clustering the 145 orthologous genes that showed significant species differences in brain expression according to their shared functional GO annotation . Several coherent groups of genes emerged from this analysis (Table 4 and 5), in addition to clusters expected due to the enrichment analysis described above (Table 3). Notable among them were the categories of cell communication and development. Genes involved in these processes likely play important roles in brain maturation and sensory development and therefore might contribute to behavioral differences among the species. For example, the honey bee ortholog of Innexin 3 (Inx 3), a gene whose protein product is important for cell-cell communication , is known to be upregulated in young bees when they are treated with the juvenile hormone analog methoprene . Such treatment also induces young bees to become foragers . Our brain transcriptome-wide expression analysis of the four key species of honey bees have provided us with several candidate genes that can be used for much needed comparative studies to uncover the molecular basis of interspecies differences in the genus. Clustering was carried out in GOToolBox using the WPGMA algorithm with a Bonferroni correction for multiple testing. A minimum cluster size of 5 genes was applied. See Table 6 for honey bee gene IDs. This study is the first cross-species comparative study of brain gene expression in honey bees. We used four species of honey bees, three Asian and one European/Western that are known to differ markedly in their nesting habit, behavior and some physiological characters. We compared brain mRNA of foragers and one-day-old bees of each species on each microarray in a replicated loop design. Performance results for the four species on the microarrays were comparable and in keeping with our current understanding of Apis phylogeny [12–14]. A significant fraction of genes in all four species followed expression patterns consistent with a previous study comparing foragers and one-day-olds in A. mellifera from Europe . 218 genes were found to be expressed significantly differentially between at least two species. Principal Component Analysis revealed strong patterns in the data that grouped the expression data into the four constituent species. Two main inferences could be drawn from the PCA results. First, there appears to be a widespread conservation of the molecular processes in the brain underlying adult honey bee behavioral maturation. Second, the overall pattern of differences did not reflect in an obvious way known differences in behavior and ecology between the four species [13, 16]. However, an enrichment analysis for Gene Ontology defined functional categories of genes responsive to biotic stimulus, involved in defense response, metabolism and circadian rhythms–that could plausibly be involved in these ecological differences, as well as in behavioral differences related to dance language. The four species of honey bees used for the experiment were all collected from suburban areas of Bangalore, a city in southern peninsular India. Three of these four species are endemic to South Asia, i.e., Apis cerana (subspecies indica, the South-Asian cavity nesting bee), A. dorsata (Asian giant or rock honey bee) and A. florea (the Asian dwarf honey bee). The fourth species is A. mellifera of Italian descent, introduced in India for commercial beekeeping purposes in the 1960s . All collections of the endemic species were carried out on natural colonies except one colony of A. cerana (which was obtained from a commercial beekeeper); A. mellifera samples were collected from full-frame hives purchased from a commercial beekeeper. Returning pollen foragers, easily identified by the brightly colored pollen loads on their hind legs , were collected from three colonies of each species mostly during peak foraging hours (10:00–14:00) in the month of November, 2003. After collecting foragers, we transferred pieces of brood comb to an incubator in the lab maintained at 34°C. Freshly eclosed workers were collected over the next 2–3 days within 0–12 h of emergence, referred to as one-day-olds . All samples were collected live and immediately flash frozen in liquid nitrogen. Heads were removed (on dry ice) and stored at -80°C until shipment. Heads were shipped on dry ice to University of Illinois at Urbana-Champaign and stored upon arrival at -80°C until further processing. Brains were partially lyophilized as in Grozinger et al , with the following changes: dissections were carried out in an ethanol bath kept on dry ice and the subesophageal ganglion was retained. Brains were rinsed post-dissection in a fresh bath of ethanol on dry ice to ensure removal of unwanted tissue debris and remnants of hypopharyngeal glands. Pools of 15 brains were homogenized in 1 ml Trizol (Invitrogen) and vortexed with 200 μl chloroform. The mixture was allowed to stand at room temperature for 2 min and then centrifuged at 12,000 g (4°C). The aqueous phase was mixed with 100% ethanol and then transferred to a Qiagen RNeasy column. Subsequent steps for extraction of total RNA were carried out as per kit instructions (Qiagen RNeasy kit for total RNA). The four species used for the study differ markedly in their brain sizes. Preliminary quantification studies showed that RNA yields from brains differed between the smallest and largest species by as much as 2 times. Therefore, after quantification using a Nanodrop spectrophotometer (ND-1000, Nanodrop Technologies) samples were pooled depending on concentration to obtain uniform yields across species (minimum pool size 30 brains, maximum pool size 60 brains). Total RNA was precipitated in 30 mM sodium acetate and 100% ethanol with 1 μg linear acrylamide, by incubating overnight at -20°C and spinning at 12,000 g for 20 minutes. Pellet was washed in 70% ethanol and air-dried. RNA was resuspended in appropriate volume of RNase-free water and 15 μg was added to 6 μg of dT18 primers and annealed at 70°C for 5 min. Single-strand cDNA was synthesized using 400 U of ArrayScript (Ambion) in an ice cold reaction mixture of 10× 1st Strand buffer, 20 U RNaseOUT (Invitrogen), 0.5 mM dNTP mix (total reaction volume 30 μl), incubated overnight at 42 °C. Reaction was inactivated by incubating at 70°C with 15 μl 0.1 N NaOH for 10 min and neutralized with 15 μl 0.1 N HCl. cDNA was purified using the Qiaquick PCR purification kit (Qiagen) with modified Tris-free buffers and dried down in a SpeedVac. cDNA was resuspended in freshly prepared sodium carbonate buffer and dye coupled as per Whitfield et al 2003 , with the exception that dye-coupled samples were pooled only after purification on the Qiaquick PCR purification columns. Four arrays directly compared foragers and day olds of each colony within each species with dye-swap, thus 12 arrays compared brain gene expression of the two behavioral classes for each species (a total of 48 arrays across the experiment, 1 array discarded due to technical problems). Arrays were hybridized and scanned as described in Whitfield et al 2002 , arrays were hybridized for 48 h.
Microarray data generated in this study meet Minimum Information about Microarray Experiment (MIAME) standards and are available at ArrayExpress  under accession number E-TABM-262. Data intensity calculations and normalization was carried out as described in Whitfield et al , with the exception that the R package MAANOVA was used for carrying out Lowess transformation and the subsequent analysis of variance (ANOVA) [33, 34]. All other statistical analyses of the data were also carried out in R. Before normalization, all genes that showed 1.5 times higher expression in hypopharyngeal gland tissue compared to brain tissue were discarded to minimize possible contamination effects as in Whitfield et al 2003 . An initial analysis was performed on each species data separately, applying an identical analysis filter. cDNAs with average expression intensity across all arrays in a species set <300 or absent from >1 array were excluded from the analysis. The species-specific data sets were used to calculate hybridization efficiency and replicability. Finally, in order to enable a combined analysis of all 47 microarrays, a common analysis filter was applied to the data. cDNAs with average expression intensity across all 47 arrays <300 or absent from >1 array were excluded from the analysis. Subsequently, using available genome sequence information , ESTs were matched to the official predicted genes from the honey bee genome project using a reverse BLAST procedure and duplicates averaged/collapsed such that each EST represented 1 gene . There were ESTs that had no corresponding match in the predicted gene database and those were retained as such. This resulted in a total of 4432 genes that were used for subsequent analysis. ANOVA was carried out on the log2 transformed intensity values in the two dye channels for all 4432 genes across all arrays. A derived data set was generated using a mixed model with dye and sample (an RNA pool of either foragers or one-day-olds) as fixed factors and array as the random factor . The derived data set was used to calculate ratios of forager to day-old brain expression levels for every gene and each array. A second ANOVA modeling sample (corresponding either to a colony or a species) as a factor was carried out. Finally an F test and a post-hoc Tukey's test were carried out to find gene expression ratios significantly different among the 4 species and between pairs of species, respectively. A Principal Component Analysis (PCA) also was carried out using the singular value decomposition (svd) function in R. The data analyzed were the log2 transformed forager/one-day-old ratios (F/DO) of expression data derived from the two-step ANOVA for the 218 genes significantly regulated between species at p < 0.001. Enrichment of Gene Ontology (GO)  categories was statistically tested through a hypergeometric test followed by the Benjamini Hochberg FDR correction using the microarray analysis tool GOToolBox . The input list was 145 known fly orthologs to the 218 genes. The functional clustering of the same genes was also carried out in GOToolBox using the WPGMA algorithm with a Bonferroni correction for multiple testing. A minimum cluster size of 5 genes was applied. We would like to thank Raghavendra Gadagkar for support during field collections and feedback on the manuscript, K.A. Ponnana for assistance in the field, Victor Chan for helping with brain dissections, Thomas Newman for laboratory support, Centre for Ecological Sciences, Indian Institute of Science for funding and infrastructure during collections, University of Illinois Sociogenomics Initiative for funding (to GER), and members of the Robinson and Whitfield labs for comments on an earlier version of this manuscript. MSS participated in designing the study, executed the experiments, participated in analysis and drafted the manuscript. CWW participated in experimental design and analysis. GER obtained funding for the study, participated in its conception, design and coordination, and helped write the manuscript. All authors have read and approved the final version of this manuscript.